Each year large numbers of Chilean devil rays, the largest of the mobulid rays, visit remote sea mounts in the archipelago of the Azores. The discovery of these aggregations has transformed the region from an important fishing ground into a Mecca for divers wanting to encounter these graceful rays, which have become a major target in the gill-plate trade. 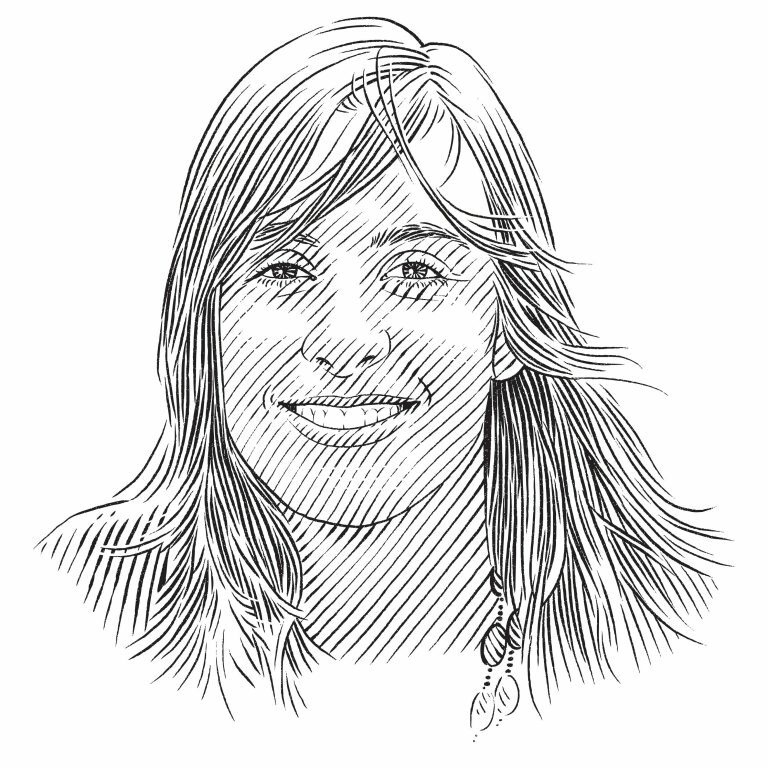 Ana Filipa Sobral is studying the mobulid rays of Santa Maria and has partnered with international organisations to ensure their protection. Every summer, remote sea mounts in the Azores archipelago are visited by the deepest diving animals in the ocean: Chilean devil rays. The predictability of their aggregations, coupled with the rays’ curious attitude towards divers, provided an opportunity for the rapid growth of a targeted diving industry. The Azores is one of only a few places in the world where Chilean devil rays are known to aggregate in large schools. It is 6.45 am and the sun has just appeared from behind the majestic Pico volcano as our boat leaves Horta marina and heads towards Princesa Alice, a sea mount located 45 nautical miles south-west of Faial Island in the Portuguese archipelago of the Azores. The sky is a mix of orange and purple and the sea is flat, its water the colour of platinum. A three-hour journey lies ahead. Although I have done some diving before, this will be my first dive so far offshore. It’s a long trip but there is plenty to see on the way, from resident sperm whales to turtles and sunfishes. I have just started my thesis on Chilean devil rays Mobula tarapacana but haven’t come face to face with one yet, so a local dive operator has kindly offered to take me out to the sea mount. I’ve heard so much about Princesa Alice, my enthusiasm and expectations are at an all-time high as we get closer. We finally arrive and there is no land in sight – we are in the middle of nowhere in the Atlantic Ocean. I feel incredibly small as I realise just how vast is the expanse of water around me. While the crew drops anchor, I give a short talk about the devil rays and ask the divers to try to get belly photos of them for photo identification. After the safety briefing everyone rushes to gear up before jumping into the ocean. At last I am in the water and it is of the deepest blue I have ever seen, with a clarity that is unbelievable – from the surface it is possible to see the top of the sea mount 35 metres (115 feet) below us. I go down to it but ascend again rapidly, wanting to have as much time as possible to look for rays. Hanging onto the anchor line in a blue world, I wait for whatever may pass by. And I don’t have to wait long. Within a few minutes, four golden shadows glide gently up from below. They swim by, performing a perfectly synchronised ballet: three males chasing a female and mimicking her movements. I watch in astonishment. At the time it didn’t occur to me that, exactly 116 years before, Prince Albert I of Monaco and his crew were probably experiencing the same sense of wonder. The leader of a research expedition aboard the Princesa Alice, Prince Albert was just starting a deep-water survey here. Expecting the sea floor to lie a few thousand metres below them, he and his crew discovered rocky ledges just 241 metres (790 feet) down. They explored the area and realised they were floating above an extensive platform that supported an amazing diversity and abundance of life, especially of commercially interesting fishes. The following day Prince Albert sent a telegram to Carlos I, the king of Portugal, announcing the incredible discovery and telling him about its importance to the Azorean fishery. The sea mount was named after his research vessel and the prince continued to study it on subsequent visits. Sea mounts are very common in the Azores – there are 461 in the islands’ exclusive economic zone alone – and they generate specific conditions, such as an increased upwelling of nutrients and enhanced local productivity that supports organisms of the higher trophic levels such as dolphins and mobula rays. They are also believed to have unique geo-magnetic signatures that are used by large pelagic species for navigation during the course of their migrations. Of the 29 oceanographic surveys that Prince Albert led between 1885 and 1915, 13 were conducted in the waters around the Azores. As well as being remote, these nine islands have a complex geological background that, together with the surrounding deeper waters, results in a unique diversity of marine habitats and of life within them. The objectives of the prince’s surveys were primarily to investigate the deep-sea fauna, but also to study the oceanographic currents and meteorology and to map the sea floor. He ended up observing all manner of creatures, from bacteria and plankton to fishes, turtles and marine mammals, between the surface and a depth of 6,000 metres (20,000 feet). His surveys contributed immensely to the progress of oceanography, a fairly new science at the time, and also played a part in devising innovative methodologies, leading to the discovery of life forms and ecological relationships that hadn’t been known about before. Although Prince Albert realised at the time that the Princesa Alice sea mount would be an important fishing ground, it’s unlikely that he could have imagined that, more than a century after its discovery, it would become one of the most important dive sites in the North Atlantic and that the revenue generated from diving would surpass by far the revenue that came from fishing. The main reason for this is the presence of majestic Chilean devil rays, which visit the sea mount every summer. The predictability of their aggregations, coupled with the rays’ curious attitude towards divers, provided an opportunity for the rapid growth of a targeted diving industry. Princesa Alice is, in fact, one of only a few places in the world where Chilean devil rays are known to aggregate in large schools. Another important aggregation site in the Azores is Ambrósio, also a sea mount, which lies three nautical miles off the north coast of the island of Santa Maria. Elsewhere, the devil rays reportedly amass in Brazil’s St Peter and St Paul Archipelago and around Cocos Island, Costa Rica. Aggregations such as these offer an incredibly rare opportunity to study the species in the wild. Nevertheless, collecting data on such oceanic and migratory animals is no easy task. The Chilean devil ray is large – more than three metres (10 feet) from tip to tip – slow-growing and one of the least fecund of the elasmobranchs, producing a single pup every two or three years. These pelagic rays occur around the world in sparse locations in the Pacific, Atlantic and Indian oceans, appearing to visit productive areas around oceanic islands and offshore sea mounts on a seasonal basis. The size of the species’ global population, like that of the other Mobula species, is not known. However, low fecundity, together with other life-history and ecological traits, make it particularly susceptible to overexploitation. A combination of different approaches has enabled us to shed a little light on the rays’ mysterious lives, especially while they are here in the Azores. We have learnt from data collected by dive operators that they start arriving in the region in June and stay until the very end of October, so they are here when the water is warmer and less productive. Satellite tagging has revealed that when they leave our sea mounts they head south; tagged Chilean devil rays have travelled distances of up to 3,800 kilometres (2,360 miles) in seven months, demonstrating their truly migratory nature. However, what they do and where they go after that remains a mystery. Located in the middle of the Atlantic Ocean (37˚–40˚N; 24˚–32˚W) between the United States and Europe, the nine volcanic islands of the Azores form the most isolated archipelago in the North Atlantic. They are the emerging peaks of a vast submarine mountain chain called the Mid-Atlantic Ridge, which divides the entire length of the ocean from north to south. In fact, the highest point of this chain is the top of Mount Pico, the volcano that forms Pico Island. The archipelago lies near the junction of three major tectonic plates: the North American, the Eurasian and the African. As a result of the high volcanic activity, sea mounts are a common feature of the region. Two branches of the Gulf Stream influence oceanic conditions around the Azores: the cold and nutrient-rich North Atlantic Current flows north of the islands, while the warm Azores Current passes to the south. The unique conditions they produce make the archipelago an important habitat for many large pelagic species that undertake Atlantic migrations and find here a good environment for breeding, feeding and growing. As a result, the Azores are of great interest to nature lovers and, especially, marine biologists. People began settling in the Azores in the early 1400s. Those early settlers could never have known that these remote islands would become an important location for modern-day explorers in search of migrating pelagics like Chilean devil rays. Sea mounts are very common in the Azores – there are 461 in the islands’ exclusive economic zone alone – and they generate specific conditions, such as an increased upwelling of nutrients and enhanced local productivity that supports organisms of the higher trophic levels. In addition, it is believed they have unique geo-magnetic signatures that are used by large pelagic species for navigation during their migrations. Chilean devil rays, however, aggregate only at specific sea mounts – those whose peaks lie at a depth shallower than 100 metres (325 feet). Shallow sea mounts such as these can be important aggregation sites for highly migratory pelagic species, but we know little about what makes them so attractive, mainly because it is difficult to determine what drives these species. A combination of factors will probably lead to the most likely explanation. Even though the rays move long distances each day, they spend most of their time at specific shallow sea mounts. Why is that? What is so special about these particular places? Why do the rays return every year? These are all questions that remain to be answered. It’s possible that the shallow sea mounts around the Azores are important for mobulid rays from a social perspective, since the likelihood of interaction between individuals is higher at them. They could also play an important role as mating and pupping grounds, given that all the rays are adult, and pregnant females are often present. However, there have been no records so far of juveniles in the area. One of the deepest-diving animals in the ocean, the Chilean devil ray can go down to 1,896 metres (6,220 feet), where it tolerates temperatures below 4 °C (39 °F). It is also an extremely fast swimmer, reaching a speed of six metres (20 feet) per second! Its dive profile suggests that it may be feeding at depth in high-density layers of pelagic organisms, possibly on fish and squid. Although this particular devil ray species is the only one to form aggregations here, it is not the only ray to visit the Azores. We also encounter the giant manta ray Manta birostris and either the giant devil ray Mobula mobular or the spinetail devil ray M. japonica (more research is needed to distinguish between these two species). The giant manta is seen less frequently than the Chilean devil, but sightings of it have increased in the past couple of years. The manta rays tend to be seen closer to shore, occasionally at sea mounts, and always as solitary individuals. Mount Pico volcano on Pico Island is the highest point in the Azores, the most isolated archipelago in the North Atlantic. The islands were first discovered by explorers during the 14th century. When Chilean devil rays and giant mantas occur together, they typically interact; usually the devil ray is observed following the manta. The third species is seen more rarely, and when it is encountered it is closer to shore and in groups of three to five individuals. We don’t know where these animals come from or where they go when they leave our waters. Further research and the development of new methodologies will be key if we are to gain a better understanding of the ecology of devil rays. What we do know is that the biggest threat mobulid rays currently face is fishing. In Asian markets there is a growing demand for their gill plates, which are used in a health tonic, and the animals are taken as by-catch as well as in targeted fisheries. In fact, the ever-increasing demand has led to a shift from incidental by-catch to targeted fishing. Throughout its wide range, the Chilean devil ray is caught both incidentally and as a targeted species, and by both artisanal and commercial fishers. It has the largest – and therefore most valuable – gill plates of all the mobulid rays and is thus in greatest demand. Its gill plates can be sold for up to US$557 per kilogram in China, and a single ray can produce up to 3.5 kilograms (almost eight pounds) of dried gill plates. Because the locations and timing of its aggregations are predictable, and because it is a highly migratory species, the Chilean devil ray is vulnerable to both coastal and offshore fishing. Even though it is not fished in the Azores, the species knows no boundaries and once the rays that we see at the sea mounts leave our waters, it is likely that they become targets for fisheries. At the global level, M. tarapacana is listed as Vulnerable on the IUCN Red List of Threatened Species, while in South-East Asia, the Eastern Pacific and the Indian Ocean it is classified as Endangered. We suspect that its global population has declined by at least 30% over the past 30 years. Only a few decades ago, the aggregations seen in the Azores were much larger than those reported in the past five years. If the demand for gill plates continues to drive unsustainable fisheries, these local aggregations may be at risk of disappearing altogether. In September and October 2016, representatives of governments from around the world gathered at the 17th Conference of the Parties to the Convention on International Trade in Endangered Species (CITES) in Johannesburg, South Africa. Here they debated a proposal presented by Fiji to include the nine Mobula species in Appendix II. An aggregation of Chilean devil rays at Ambrósio dive site off Santa Maria island in the Azores. Unique oceanic conditions make the Azores an important habitat for large pelagic species like mobulas. In the lead-up to the vote on the proposal, the Manta Trust launched a media campaign, #LoveMiniMantas, to encourage the delegates’ support for the protection of Jamantas (the name for mobulid rays in Portuguese). The main component of the campaign was Daniel Copeland’s virtual reality (VR) film The Mini Mantas of Maria, which gave the delegates the opportunity to ‘dive’ with Chilean devil rays at Ambrósio sea mount as a 360-degree VR experience. During the seven days before the proposal went to the vote, the film was seen by 350 delegates, some of whom had no idea of what a devil ray looks like; most had never even dived before. There’s no doubt that the VR experience had a positive impact on everyone who shared it. Back in the Azores, the people of Santa Maria were very happy that their little island and the waters around it became the ‘face’ of this worldwide campaign for the protection of mobulid rays. When the campaign was over, the local municipality expressed its intention to propose the creation of a sanctuary for mobulid rays in the area. Even though these species are not fished here, the island wants to set an example to the rest of the world and at the same time draw attention to the importance of these unique and precious places on its doorstep. A sanctuary would also raise awareness among visiting divers of how vital it is that we protect this habitat and its species. The divers, too, can contribute directly to research on mobulid rays in the Azores through the SOSF-funded project ‘Manta Catalog Azores’. All they have to do is report their encounters with the rays and take identification photos of them. Sightings at aggregation sites like Ambrósio and Princesa Alice are going to be fundamental in increasing our knowledge of mobulid rays in the future. On 3 October 2016 history was made at the CITES conference when, as a result of the hard work of many different people and organisations, a staggering 85% of votes ensured that all nine Mobula species would be protected under Appendix II. In effect, mobulid-derived products can now only be traded legally in international markets if they come from sustainably managed fisheries. While the CITES listing alone cannot guarantee protection for Chilean devil rays, it does represent a critical step forward in the bid to ensure that these golden shadows continue to grace the deep blue waters of the Azores during their annual migrations. And I will do my part by continuing to work on unravelling the secret behind why they come to our underwater mountains and what they do here. A look behind the scenes of the 360 Virtual Reality film The Mini Mantas Of Maria. The Mini Mantas Of Maria was created by Danny Copeland and his team (Ana Filipa Sobral, David Diley, Shawn Heinrichs and Maya Santangelo) to support and promote the campaign to protect Mobula Rays at CITES 2016.